Autumn is not restricted to gloomy days, especially in Azerbaijan, where one can find so many flamboyant fruits and vegetables, rich in both vitamins and taste. One bright spot in the rainy autumn season is the kumquat, or golden tangerine. The kumquat is both sweet and tangy and can be eaten whole, including the skin. Yet, it is not very popular, as it was brought from Asia to Europe fairly recently, in the mid-19th century. Nevertheless, the fruit is slowly winning over citrus lovers with its unique flavor. Today, the fruit is grown around the world, as well as in Azerbaijan. Kumquats are available from November through June. The low-calorie fruit, despite its small size, is an excellent source of phyto-nutrients, such as dietary fiber, minerals, vitamins, and pigment anti-oxidants, that contribute immensely to one's overall wellness. The peel of the fruit is rich in essential oils, anti-oxidants, and fiber. Fresh fruits, in general, contain vitamin A, C, and E and protect consumers from cancers, diabetes, degenerative diseases, and infections. Moreover, the kumquat has high levels of vitamins from the B-complex group, such as thiamin, niacin, pyridoxine, folates, and pantothenic acid. These vitamins function as co-factors for metabolizing carbohydrates, proteins, and fats. In addition, the fruit is a modest source of minerals such as calcium, copper, potassium, manganese, iron, selenium, and zinc, which are good for the bones and teeth, red blood cells, and for cellular oxidation. The nutrients provided by this fruit are also extremely valuable for the nervous system. 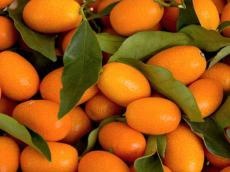 The kumquat is used for the treatment of apathy, depression, neuroses, chronic fatigue syndrome, and the restoration of stability in one's emotional health. It also helps alleviate stress. The golden tangerine is newly mature in November, and while buying it, you should select fruit that is firm, smooth, a brilliant orange color, and has an attached stem. Stay away from unripe, green fruit or those with damaged skin. Kumquats can be prepared in various ways, including eating them fresh or candied, adding them to green salads or fruit salads, or using them as a garnish. There is a trick to getting the most out of the fruit: Gently roll or squeeze it before consumption. This process binds the sweet components in the thin rind with the underlying tart flesh. The bright fruit is also used in marmalades and preserves, juices, cakes, pies, and ice creams. It can be used as a marinade for poultry, lamb, and seafood. Even dried kumquats have their uses. In fact, the dried form is stronger than fresh kumquats since the nutrients and flavors are more concentrated. Last but not least, the kumquat tree makes an elegant ornament in any home, adding cheer to a rainy day. In all its forms, the golden tangerine is a must-buy during these gloomy autumn days.